We always explore ways to bring our brand into customer's life in a harmonious way, realizing a stress-free environment through challenging the status quo. For service and maintenance appointments, simply contact Genesis Service Valet, and we'll come to your location of choice to pick up your vehicle and also extend you a Genesis loaner to use in the meantime. Multimedia and Navigation Updates Advanced technology includes complimentary map updates to your vehicle's navigation system for three years, to ensure you're always accessing the most up-to-date mapping. Once you take delivery of your vehicle, you're seamlessly enrolled in our 3-year complimentary 24/7 Roadside Assistance program. In the rare event your travel plans take an unexpected turn, Roadside Assistance will provide timely towing to the nearest Genesis dealership or authorized service facility. Avoid congestion before you reach it with detailed information on traffic speed, accidents, construction, road closures and more with complimentary SiriusXM Traffic & Travel Link for 3 years. The Genesis Intelligent Assistant is a proactive app intended to help save the driver time and provide high levels of convenience. 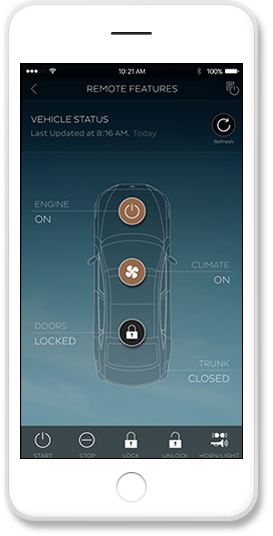 The app combines connected car features like remote start, data from the vehicle, the owner's smartphone and the internet with multiple layers of intelligence. This allows the Genesis Intelligent Assistant app to send proactive notifications and recommendations to Genesis owners in preparation for their drive.